History of mural paintings dates back to 9th-12th century, originating from temples and palaces of Kerala and thus gets referred to as temple art too. The art form was patronized by the kings and the art most naturally found its roots in subjects connected to religion, spirituality and nature. The medium for painting (colours) are primarily pigments procured from natural sources. Just five colours called ‘panchavarna’ (meaning five colours) go into mural paintings even today, and the five colours are yellow, green, blue, black and white. Each mural saree is unique as they are individually and painstakingly hand painted. Each one has a story to tell you; right from mythology to folklore. 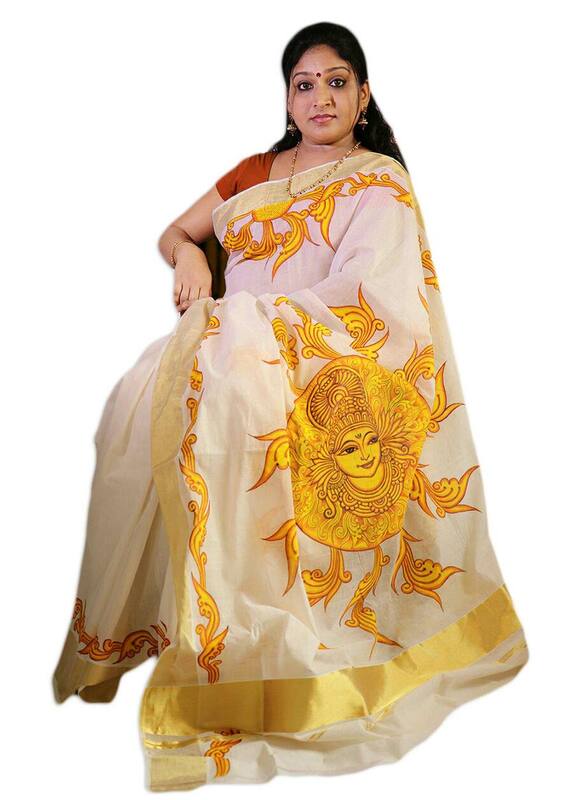 Creating this delicate mural painting of surya dev in vibrant natural colours onto the pallu of this pure Kerala handloom kasavu cotton saree requires high level of skill and precision. This mural saree presents the surya dev or sun god in his full glory.